The Sustainable Workplace Alliance is a not-for-profit 501(c)(3) organization that focuses on the environmental, health and safety training needs of US industries. We provide expert guidance to employers and employees in such areas as OSHA regulations, Hazardous Waste Operations, DOT HAZMAT transportation, risk management and emergency response. 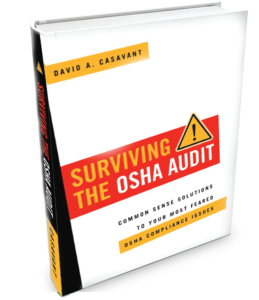 Within this book, respected OSHA consultant, David A. Casavant takes you behind the curtain and reveals exactly what happens during an OSHA inspection, rules for behavior during the audit and perhaps more importantly, what you can do now to comply with the often-complicated OSHA regulations. Copyright 2017 | Sustainable Workplace Alliance | Website Managed by Creative Pinnacle, Inc .